2017 Marucci Cat 7 Connect BBCOR – Best For Power? Seeing the Marucci Cat 7 Connect BBCOR in action can be a real shocker, especially when you compare its performance with the previous Cat 6. It’s a truism in consumer goods that a new model is only a little bit better than the version on which it was based. The Cat 6 was the brand’s BBCOR flagship model, and it was excellent. So for Marucci to even match its capacity was a challenge. Improving upon it is a tremendous success, even if the improvements were slight. But the significant upgrade that the 2017 Marucci Cat 7 Connect BBCOR represents seems like a truly revolutionary step up. The boost in features and performance will even have current Cat 6 owners tempted to go for the new model. So let’s proceed with this Marucci Cat 7 Connect review and see what’s in store for us. As most people who play in high school and college baseball leagues know, BBCOR standards have been blamed for lower scores ever since their introduction in 2011. In fact, BBCOR standards were introduced because bats at the time were just too effective. So nowadays, these new standards keep the non-wood bats at performing only a little bit better than wooden bats. But that doesn’t stop brands like Marucci from trying to buck the trend. The Cat 7 Connect is for power hitters. It’s designed to really help homerun hitters to maximize their potential. It uses a new AZ4X alloy for the barrel, and this one is even stronger and comes with a better response rate than the previous AZ3000 alloy. Like most alloys, it’s virtually ready to use right out of the box. There’s really no need for a break in period. The barrel has been optimized to an absurd degree. The new sweet spot isn’t just a little bit bigger than the one you find on the CAT 6. It’s twice as big. Repeat—that’s double the area where you can hit well enough so you don’t get the vibes that can mess up your hands. Is This a One-Piece or Two-Piece Bat? It also comes in a 2-piece hybrid construction design, with a handle made from a carbon composite. A 2-piece design is much easier to customize. Despite the 2-piece design, the barrel is “ring-free”. This technology eliminates the presence of “dead spots” that are quite common in low-quality 2-piece designs. A dead spot, as you can probably guess, is an area of the bat where if the ball makes contact then it goes the opposite of popping out. Instead, it’s as if it’s muffled somehow so it doesn’t go as far as it should. A dead spot area doesn’t provide any bounce, so it’s as if you bunted the ball even though you took a mighty swing at the plate. Even if you mishit the ball and somehow you make contact outside the sweet spot, you don’t have to worry about the vibrations hurting your hands. That’s because the Marucci Cat 7 Connect BBCOR uses the new SDX technology. This is the Shock Dissipation Connection Technology that somehow eliminates much (if not all) of the negative vibrations that occur when your bat’s contact with the ball lies outside the sweet spot. So you still get a solid feel upon contact and everything goes smoothly. This is achieved with the carbon composite handle, which on one end is covered by materials that selectively dissipates the vibrations. On the other end, the handle is wrapped by a silicone overlay that isolates these vibrations. What About The Handle and the Grip? The handle comes with custom micro-perforated soft touch grip. You can compare this to how some tennis rackets have rubber handles with perforations so that players don’t suddenly have their rackets slip from their fingers. Basically, the surface allows you to have a more secure grip while you still feel comfortable grasping it in your hands. It won’t slip from your grasp whether you swing and miss or you swing full blast and make contact. 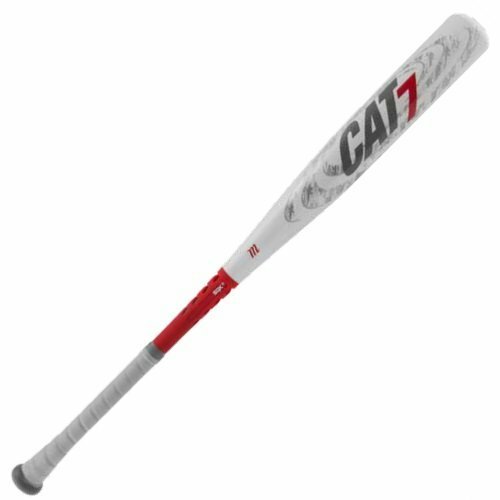 The focus for the Marucci Cat 7 Connect MCBCC7 is for optimum power, as it combines the balance and weight of the bat for maximum pop. This isn’t really for singles hitters who can scurry to first base while the ball is still in the infield. This Cat 7 Connect BBCOR is for power hitters who have the strength to simply blast the ball into orbit so they can jog around the bases for their home run. It comes with a higher MOI (moment of inertia, or “swing weight”) than the 1-piece CAT 7. So they’re designed for the stronger players, who have the strength to actually wield this bat with some control. And with its weight, any solid contact with the baseball can have the ball travel much farther. It also comes with the standard 12-month warranty. But don’t take that for granted because some cheaper bats have shorter warranties. It’s available in 4 sizes, from 31 inches (28 ounces) to 34 inches (31 ounces). Watch this video to see all the ins and outs of this bat. Play it all the way through because it lists every single feature. Let’s first define who this bat is for. This isn’t for spry Ichiro-types who can spray singles and infield hits all day long. This bat is for well-muscled Mark Trumbo-types who love to swing for the fences. Only these strong players have the strength to actually control the bat so it goes where they want it to go. The MOI is formidable, so it’s like wielding a heavy sledgehammer which has most of its weight at the tip. You have to be very strong to wield such a bat, which explains why Barry Bonds became a home run king when he suddenly developed huge muscles. And just about every feature of the bat is designed to make sure that this home run king gets all the help they can legally accept. The improved alloy offers a lot of pop, and that “trampoline” effect seems very much in play. Also, the strong alloy offers a lot of durability. Not all alloys are this strong, mind you. Some tend to cave in rather easily. The greater swing weight also provides lots of power. That heavier MOI may be a problem for precision hitters, but for power hitters it’s a big plus. The weight at the end provides the force needed to hit a fast-moving ball into its opposite direction. Some hitters may feel an unconscious caution about hitting too hard, since hitting a baseball wrong can be rather unpleasant for the hands. Contact with the ball can create vibrations that can travel through the length of the bat, and often that vibration can sting the hands. But again, there’s no point worrying about bad vibes in the Cat 7 Connect. The alloy, the handle, and the special anti-vibe technology virtually eliminate this menace. That means you won’t have to distract yourself with worry that you’ll mishit the ball and hurt yourself. There’s no penalty of physical pain when you make a mistake. Besides, the sweet spot—the area which doesn’t cause vibrations when it makes contact with the ball—is humungous. Seriously, it’s double the size of the previous CAT 6, and that was the best of the Marucci lineup. You can’t be blamed from suspecting that pretty soon the entire bat is a sweet spot! The first, of course, is the price. But then again this should come as no surprise. In baseball, you get what pay for. You have to admit that its price is actually fair, since it’s comparable to the price of other premium bats in the market today. Some bats are even more expensive, even though it’s debatable if they’re better than the Cat 7 Connect. The other concern is that next year, Marucci will once again come out with a huge improvement, so that the Cat 7 Connect suddenly becomes obsolete in a year. This may seem unlikely, but then again most people didn’t think that the CAT 6 would be improved by this much. So it’s like paying a lot of money just to use the bat for a single year. This is the kind of trend that explains why some people only bought the CAT 6 this year now that the Cat 7 is out. The discounts are fantastic. If you’re in the market for a new bat, and you’re a power hitter, then this bat has your name written on it somewhere. As you read from this Marucci Cat 7 review this bat offers you the weapon you specifically designed to match your power, and your hands are protected from the sting of mishits. Get the Marucci Cat 7 Connect BBCOR and see your home run and extra-base hit stats explode with this bat. 2015 Marucci CAT 6 BBCOR Baseball Bat - Fastest Swing?